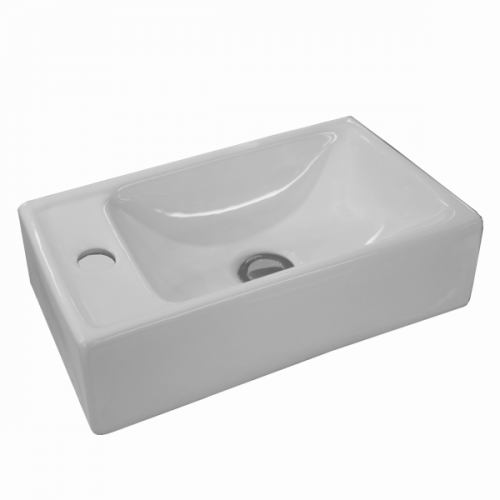 The Quado Compact is a stylish compact bathroom basin. Suitable for installation in bathrooms where space is limited, it can be wall-mounted or cabinet mounted. It makes an excellent choice for all types of bathroom designs, ranging from classing to contemporary. 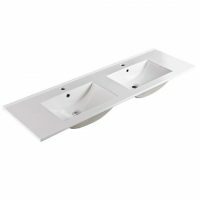 The Quado Compact basin is crafted to perfection out of vitreous china, and it features a bowl capacity of 2.9 litres and measures 400x230mm in dimensions. 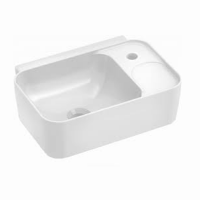 It comes equipped with a single tap hole and includes a soap platform area for added functionality. It includes a 32mm chrome pop-up waste and is not supplied with an overflow. Experience the perfect blend of style and practicality with the Quado Compact basin. Due to top quality manufacturing and solid artistry, it offers added durability and longevity. 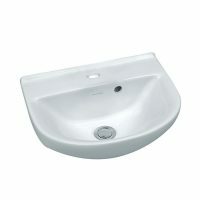 For a stylish basin for compact bathrooms in Perth, choose the Quado Compact basin at Ross’s Discount Home Centre. Shop from our online store today to purchase this compact bathroom basin at the best price in the market and avail our 14-day money back guarantee!